to light, waterproof bags, with many practical pockets. Besides, who does not have at least one broken umbrella each year? Group A-Fabrics/3. Umbrellas There are 4 products. Waterproof Shoulder Bag-Black/Skull-Small. It is made from an umbrella waterproof fabric decorated with a handmade button from sea driftwood and a black strap for hanging from the shoulder, with adjustable length. 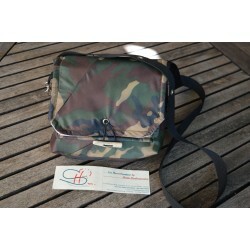 Waterproof Shoulder Bag- Military -Small. It is made from an umbrella waterproof fabric decorated with a handmade button from sea driftwood and a black strap for hanging from the shoulder, with adjustable length. Waterproof Athletic/Junior Shoulder Bag-Blue/Red-Medium. It is made from an umbrella waterproof fabric decorated with blue details and a blue strap for hanging from the shoulder, with adjustable length. Waterproof Travel/Beach Shoulder Bag-Off white/Black polka dots-Large. It is made from an umbrella waterproof fabric decorated with red details and a black strap for hanging from the shoulder, with adjustable length. The bag is lined inside and reinforced with ironing fabric.